Because Skylake is built on the same 14nm process technology as Broadwell, the team needed to dive into microarchitecture and design innovations to make any improvements. Intel claims that every part of the interconnect, including IPs, I/O, PLLs and more, had power reduction work done on them individually. In particular, video playback and multimedia (capture, RealSense cameras) were targeted for more substantial and more direct power improvements. Another example is for higher resolution displays. In the move from 2560x1440 to 3840x2160 there is a 1.6x pixel increase but Intel was able handle that change with only a 1.2x in power. Easily the most interesting new feature in terms of power is called Intel Speed Shift Technology. This feature actually moves much of the control of P-states (performance states) from the operating system to the architecture itself. P-states are what tells the CPU to move between frequencies in order to balance performance and power consumption. In previous designs, Windows and other operating systems would perform the actual state changes. With Speed Shift, Intel is able to directly change the P-states on the processor and this results in a 30x improvement in the speed of that transition. Why is this useful? First, the speed improvement in that transition should result in added “snappiness” in areas where the frequency needs to increase quickly as a result of user interaction or application need, lowering the apparent latency of some actions. Also, this gives the Skylake processors the ability to manage things like low residency workloads better. Take video recording as a good example of this type workload. Traditionally, a CPU would increase frequency to get through a set of work as quickly as possible to get to idle as fast as possible. For applications that run consistent and repeated, but non-demanding, workloads it might be more efficient to keep the CPU at a slightly higher frequency the entire time rather than spiking up and down repeatedly. Intel Speed Shift gives Skylake that capability. There are some caveats of course – this only works with Windows 10 today as it requires some unique communication between the processor and OS. For older operating systems like Windows 8 or even other OS paths like Linux, Speed Shift won’t work out of the box. Intel says they have started engaging with the open source community to integrate support for it, which is great, but until then you’ll essentially be reverting to legacy P-state controls on Skylake hardware. Also, Intel's engineers told us that Speed Shift works within a "window" of OS-based performance states so it seems that Skylake does not have complete autonomy when it comes to selecting core frequencies. Duty Cycle Control makes a return with Skylake as well allowing the cores to emulate lower clock speeds that that lowest P-state offers through enabling and disabling the core as necessary. This is kind of an inverse method to the Speed Shift Technology noted above but can be useful to reduce leakage on very low power envelope designs. Skylake also includes new Speed Step Technology for new domains including the system agent, DDR and eDRAM I/O. This helps to provide better performance on low bandwidth usage workloads by increasing the clock speeds on the cores and graphics when it’s available. For the first time in a mainstream processor, Intel is integrated another co-processor for image signal processing (ISP). This integration is a complete imaging and camera solution with full hardware and software integration. With support for up to 4 cameras (but only two at the same time), it’s clear that Intel is dedicated to the idea of RealSense technology for future devices and user interaction. Camera sensors up to 13MP are supported across the board and Intel is working with the ecosystem to improve time to market and lower engineering costs. The ISP integration itself takes the input that flows from the CSI (camera sensor interface), through the camera control chipset and helps to enable advanced imaging technologies like face detection, multi-stream capture, HDR and low light capture, burst, and more. And of course, embedding it in the chip means that it is lower power and higher efficiency. Intel promises that the ISP will enabled “zero shutter lag” and 4K/30Hz capture capability. Intel SGX is a new set of extensions for IA that enable secure computing environments called enclaves. These instructions allow an application to be opened in an environment with application level trusted execution environments, or TEE. This will allow any application to keep a secret, whether that be code, data or both. The benefits of this are obvious: protection from software attacks including even kernel software. But SGX also enables hardware attacks with protected DRAM. The protected “secret” data, whatever the application has deemed that to be, cannot even be viewed using processor debug tools like ITP. For more information on the graphics implementation in Skylake, be sure to check out my earlier dive into it. Honestly, there is still a lot we don’t know about Skylake. 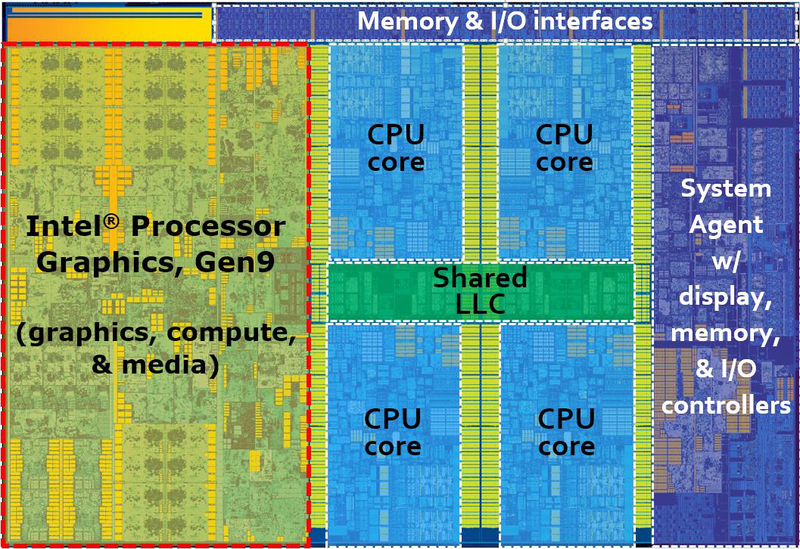 Even the basic information about total width of the execution cores seems to be a closely held bit of information the Intel is unwilling to openly discuss. Still, it is clear from what we did learn this week at IDF that Skylake is more than just a simple refresh in the Intel Core architecture and the engineers responsible for it have done an amazing job of balancing power, form factor and performance in ways unseen from any other design from any other vendor. If you wanted to find out the SKUs and product specific information about Skylake, check back with me here in very early September.